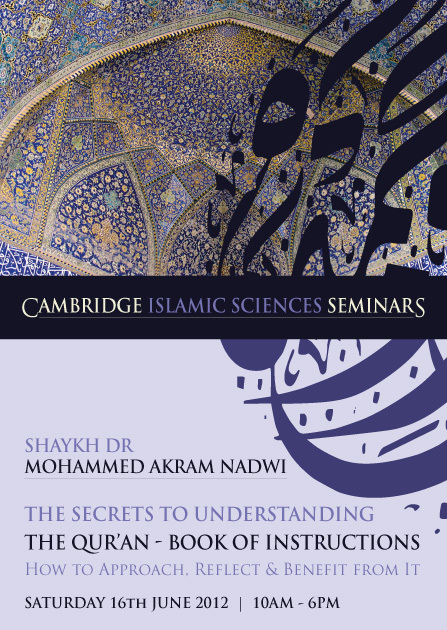 Cambridge Islamic Sciences: Why Does The Qur'an Seem Incoherent To Many Muslims? Qur'an is no ordinary book and therefore it does not conform to the style, format or the structure of any ordinary book. When people start reading The Qur'an (especially a translation) with the framework of an ordinary book in mind (which often has a sequential structure) they may be confused by this non-conformance and stop reading. This is the case with even Muslims although many would not admit it. That is one major reason why the vast majority of Muslims remain ignorant of the meanings of the Qur'an except for a few short surahs. The Qur'an has its own divine arrangement - unique style, format and structure. The arrangement is not chronological in order. Sometimes latter surahs come before earlier surahs and even the ayahs within a surah are not chronological. Also the Qur'an seems to jump from one theme to another and one story to another within the same surah. This is very puzzling for many people. Knowing the style, format and structure of the Qur'an is the key to understanding the Qur'an. But can these skills be acquired by reading a translation or referring to a particular Tafsir or reading any other book? Sadly not because this requires a competent teacher to explain the details in a way which books by themselves will not be able to do justice. So this your unique opportunity to undertake this lifetime journey with a seminar on the detailed study of the Qur'an conducted by one of the most competent and respected teachers today - Shaykh Dr Mohammad Akram Nadwi. You will come out of the seminar with a brilliant framework to study and understand whole of the Qur'an in a way that may have seem impossible in the beginning. So please don't miss this absolutely vital seminar that will shape your relationship with the Qur'an for the rest of your life. This is also your opportunity to connect to the Qur'an with a chain linking all the way back to the Prophet Muhammad (SAW) then Jibreel (AS) to Allah (SWT) Himself.